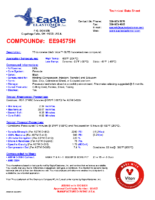 Product Spotlight - EE94575H Viton Compound Certified to Aerospace Specification AMS-3384 - Eagle Elastomer Inc. In 2013, a new aerospace specification intended for Fluoroelastomer products requiring low temperature sealing (-30C) was adopted by the AMS committee. This specification supersedes AMS-R-83485 and creates two specifications: AMS3000-series (AMS-3384) and AMS7000-series, with a new part specification added. 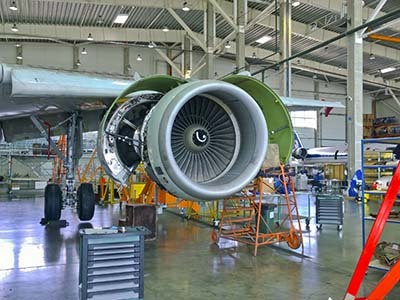 The technical requirements of AMS-R-83485 have been maintained, with the addition of a long-term compression set requirement, replacement of AMS3021 (diester) with BP Reference Oil 300, AMS 3085 (representative of HTS class gas turbine lubricants), and the addition of a glass transition (Tg) value/requirement. 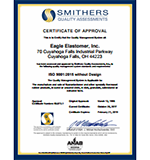 Since AMS-3384 has been adopted, Eagle Elastomer developed a compound that would pass and could be certified to this specification for cured, extruded and sheet products. 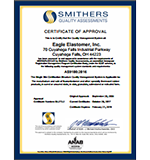 In the fall of 2015, Eagle Elastomer submitted Tensile slabs as well as uncured material to an outside independent accredited laboratory for testing to this specification. On November 9, 2015, we received the results showing our submission passed all required parameters of the compound specification. Eagle Elastomer can supply this compound in a variety of extruded forms, as well as vulcanized and post-cured sheet to meet the requirements of AMS-3384. Eagle specializes in fluoroelastomer compounds to the extent that no other polymers can be found in our facility. This eliminates the potential from cross-contamination with a polymer or chemical which would be detrimental to the compound, whether yours or ours. We operate a quality system registered to the exacting requirements of AS9100D with ISO 9001. 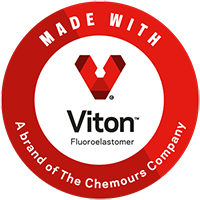 This compound is developed and supplied out of Genuine Viton™ Fluoroelastomer. Test report available upon request.